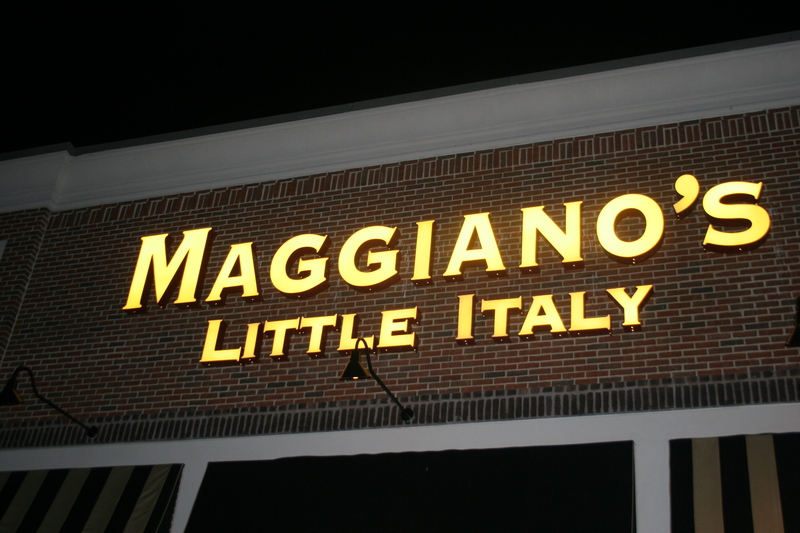 About a year ago we had dinner at the Maggiano’s near the Cherry Hill Mall in NJ. That review is available in the column on the right. 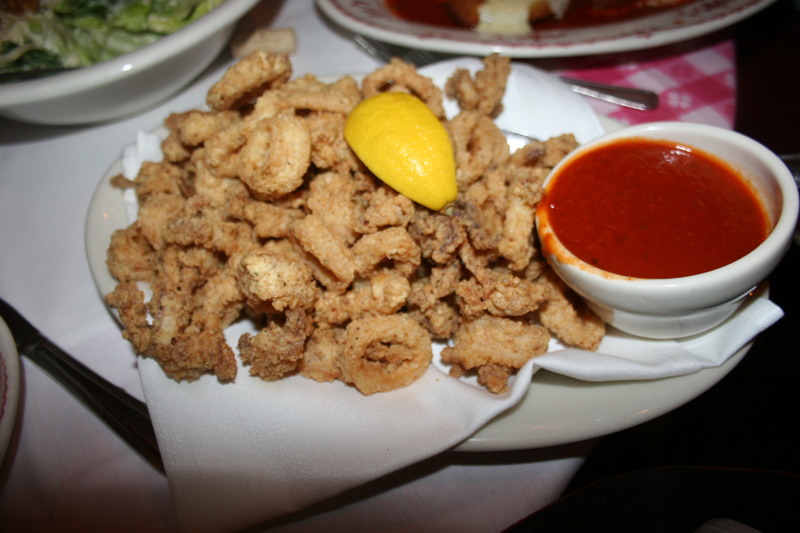 This time, we had a group of visitors at work that we were taking to dinner at Maggiano’s near the King of Prussia Mall. Our table of seven opted for the “Family Style” dining which, I believe, the restaurant almost insists on for parties of four or more. We chose the “Classic Family” over the more expensive ‘Chef’s Choice” because it seemed to offer plenty of selections without the additional $10.00 per person cost. It’s not likely the wine list at Maggiano’s will be mentioned in Wine Spectator’s Honor Roll but there is enough to find a couple of decent offerings in a few different price ranges. 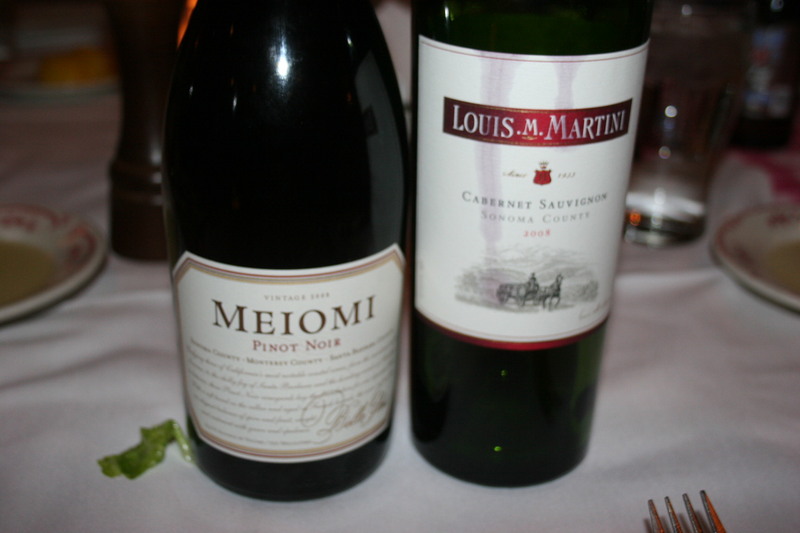 I settled on a 2008 Louis Martini Sonoma County, Cabernet Sauvignon. At about twice the retail price it wasn’t a bad markup and this one always provides good value. It went very well with many of the rich pasta dishes. I also zeroed in on something a little lighter and one that I have long wanted to try. Belle Glos makes some really good Pinot Noir in the $45 to $50 range but I ofen see another of their Pinot Noirs at about half the price. The 2008 Belle Glos, Meiomi, Pinot Noir. Using grapes from Sonoma, Monterey and Santa Barbara they have managed to produce an excellent value Pinot Noir in its price range. It went well with the lighter chicken dishes and was tasty all by itself. 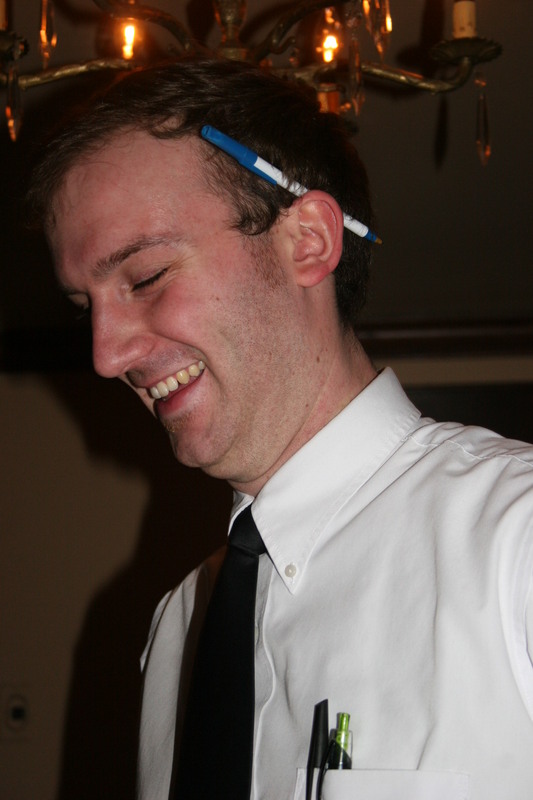 Our server, Matt, was attentive and efficient all evening and made sure that the courses appeared at the right intervals and that we had plenty of everything. Maggiano’s Salad and the House Caesar Salad. 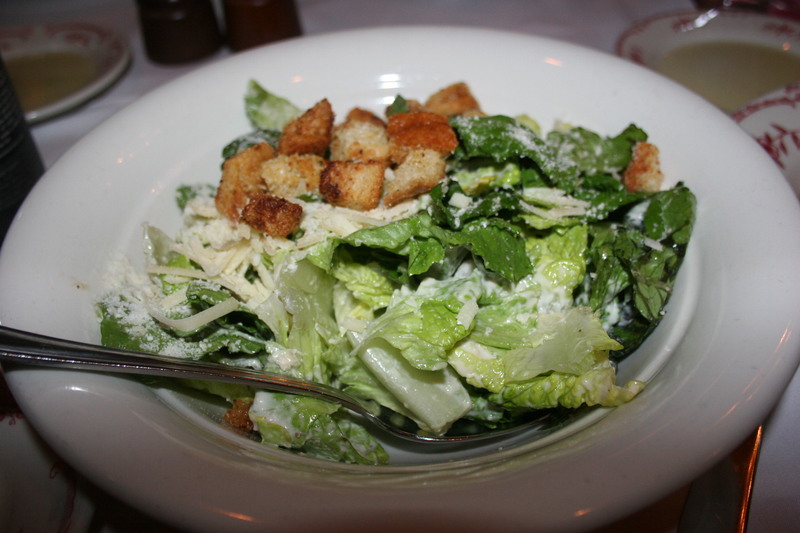 The Caesar was your typical Caesar with crisp Romaine and just the right amount of dressing. 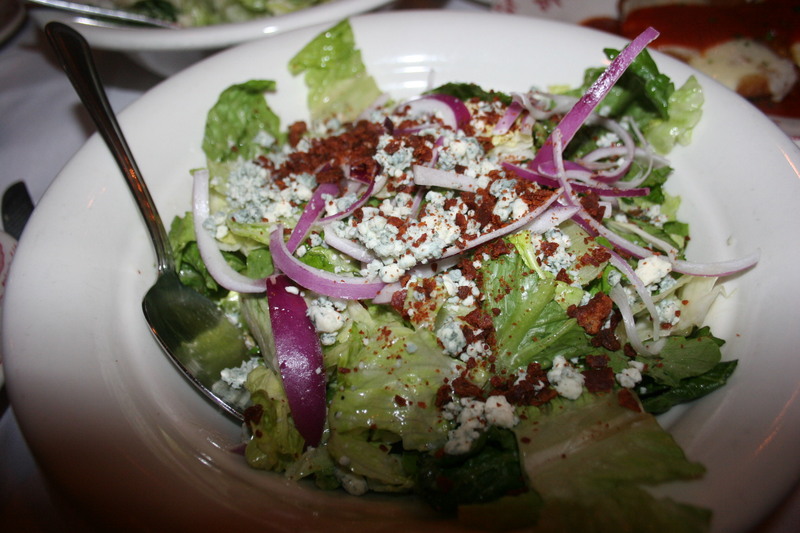 The Maggiano was a little more unique with Iceburg and Romaine lettuce, crumbled blue cheese, crispy prusciutto and red onions with a signature house dressing. The starters and salad had done nothing but whet our appetite for the four main courses which were now appearing at the table. 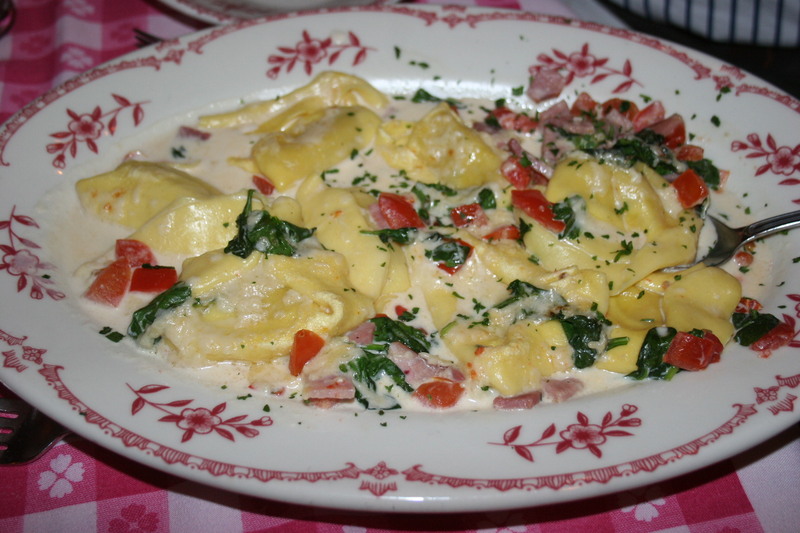 The first member of this culinary quartet was the Chicken and Truffle Tortellacci which even sounds good. This is a very rich dish and I hardly made a dent in it before deciding this might be a dinner for tomorrow night (as it turns out, it was just so heavy that I barely could finish a few of the Tortallacci’s the next night). 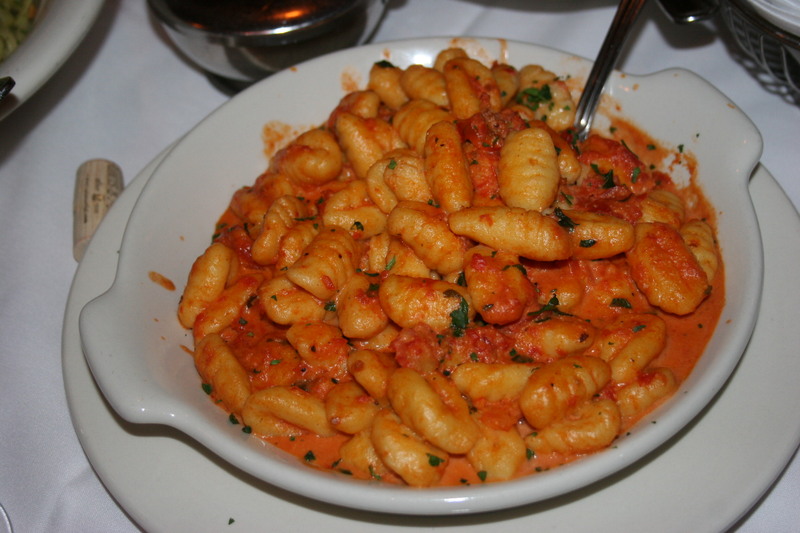 One of our group just totally had his heart set on the Gnocchi in a Vodka Cream Sauce. The rest of us went along with his choice and our second entree was soon being passed around the table. 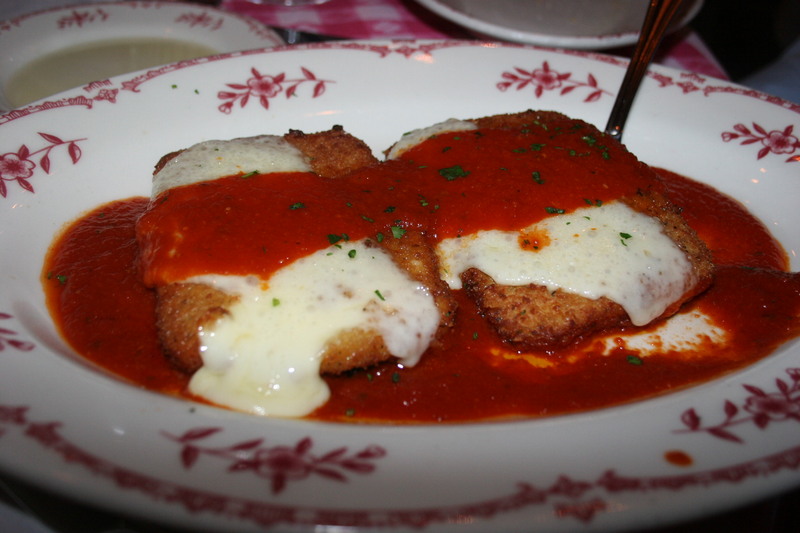 It was fresh and the sauce was flavorful but it really wasn’t anything special. There was quite a bit of this dish remaining when we were finished and some got taken home for later consumption. 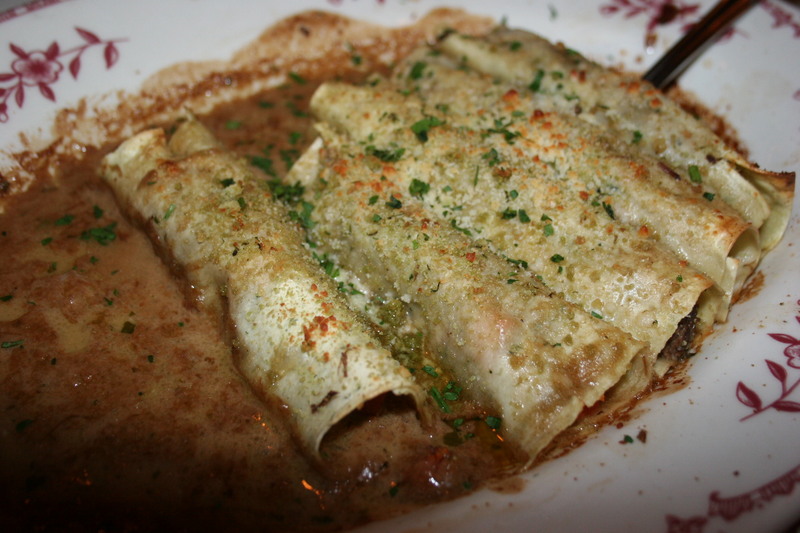 The third of our four entrees was the Braised Beef Cannalloni, braised short ribs, Asiago cheese in a balsamic cream sauce. This one sounded much better than it tasted as the edges of several of the canneloni were hard possibly indicating that they were micro-waved before serving. Perhaps not everyone agreed with my evaluation as I don’t recall many left on the dish at the end of the meal. 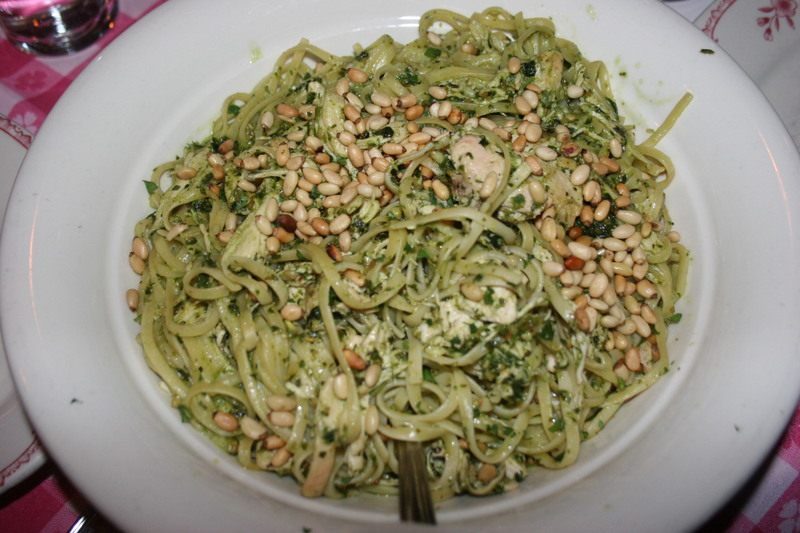 I did enjoy our final entree, the Chicken Pesto Linguine, linguine tossed with roasted chicken, pesto and pine nuts in a parmesan broth with a hint of lemon. Aside from being just a tad short on chicken, this dish was tasty and had lots of flavor. The pesto was rich and added a nice touch to the pasta. The food is not gourmet fare but as I mentioned in the beginning, you are not going to go home hungry and everything is pretty good. We still had two desserts to share and we topped off our meal with…. 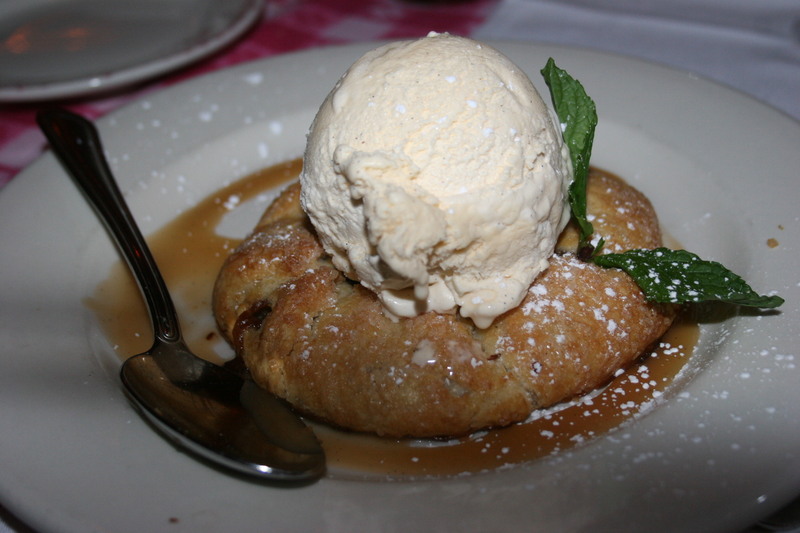 Apple Crostada, Granny Smith apples baked in a pastry crust dipped in cream and crystalized sugar and served with a scoop of vanilla bean ice cream and caramel sauce. Sound good? It was! 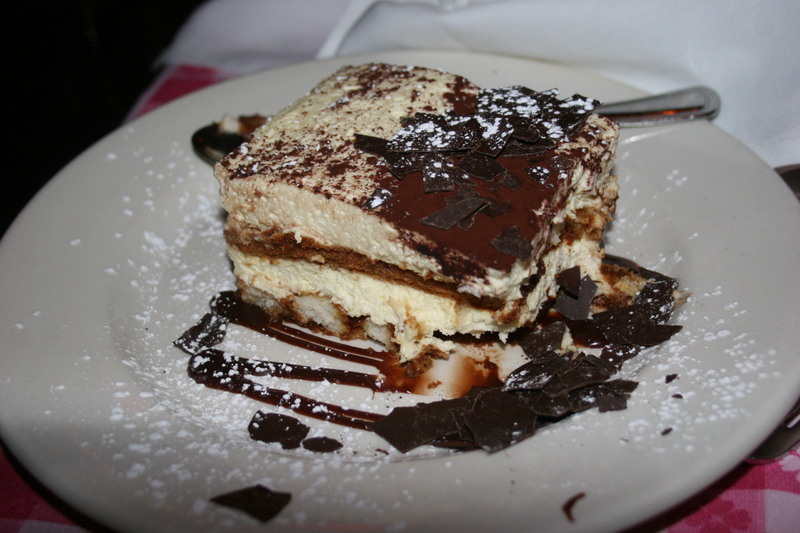 We also went with the traditional Tiramisu and it was light as a feather with lots of chocolate shavings surrounding the delicate creation. I think the entire group felt that overall we got our moneys worth and that the wines were a nice compliment to the entire meal.